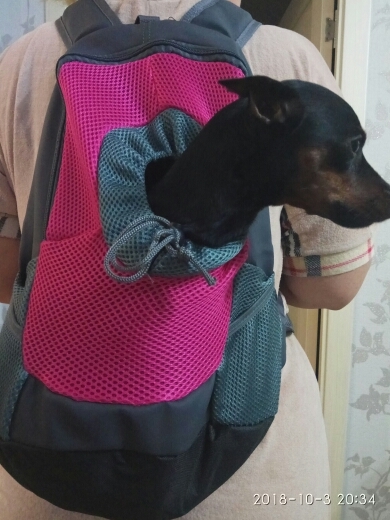 This canine backpack is just the thing for taking your four-footer out and about as you run errands! This backpack uses a soft mesh design that's ultra-breathable and provides plenty of circulation for your pup. Your dog can simply poke his head outside and watch the world go by, but owners can rest easy knowing that the backpack has an inner lead attachment that can hook onto your dog's harness, keeping your fur baby safe and secure. This pack comes in five different colors and two sizes (small and medium)! Make sure to check fitting guide blow. Please note that this carrier is only suitable for small dogs under 10 lbs! NOTE: We're able to offer you great deals because our products take some time to ship - expect 3-4 weeks for this item to arrive (although many items arrive sooner)! Hi there, thanks for the question! Products are manufactured in China. There's a sizing chart below the product description - for an 8/9 lb dog, you'll want the medium. Have a great day! I'm sorry, I'm afraid we don't at the moment (just US for now) but we'll be working on adding this ability in the future! Our new puppy loves this backpack carrier. It was definitely worth the wait! Hi Linda - we'd be happy to issue you a refund or send you a new backpack. Please reach out to us at info@thinkofthefloofs.com. Very comfortable and good backpack. Product excellent. Best than I expected. Very good - for dogs Chihuahua weighing 2,8 kg fit perfectly. Good quality.